A Maltese researcher has deve­loped a novel medical video compression system that achieves a 28.25 per cent gain in compression over the latest lossless video compression standard (HEVC) while reducing the encoding time re­quired and retaining diagnostic quality, as shown both by objective metrics and subjective evaluations. 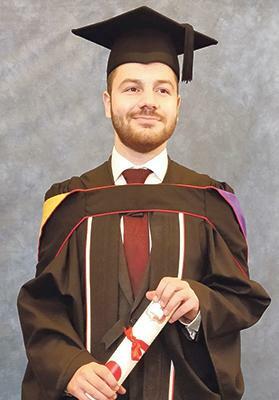 The system was developed by Daniel Bonanno as part of his research on the compression of medical video during an MSc in ICT (Telecommunications) that he was recently awarded by the University of Malta. The system makes use of a convolutional neural network to perform super resolution, with an enhancement layer also transmitted such that diagnostic regions of interest retain high quality. In recent years, the transmission of medical video has become more mainstream, especially as a result of a growing demand for mHealth systems, where wireless devices are used to aid healthcare. Furthermore, as screening for early detection of pathologies becomes more popular, the amount of medical video genera­ted is also on the rise. However, with advances in technology, medical video file sizes are becoming much larger. To ease the burden on both band­width-limited transmission channels and storage systems, Bonanno’s research focused on the development and analysis of a diagnostically lossless medical video compression scheme aimed at retaining the diagnostic capabilities of medical video. The research was carried out under the supervision of Prof. Carl Debono from the Department of Communications and Computer Engineering of the University of Malta’s Faculty of ICT. Bonanno is a research support officer at the Department of Systems and Control Engineering of the University of Malta’s Faculty of Engineering, where he is currently carrying out work related to eye-gaze tracking. His MSc was supported by an award under the Endeavour Scholarships Scheme.